Sometime ago I was trying to not only learn the notes of some songs, I was interested in also seeing how the technique was applied on the guitar, after watching Nick Johnston playing I wanted to learn to play again, from the basics. I started watching some videos in YouTube and then I realized that the YouTube player now includes the ability to slow the playback down, and it helped me a lot to watch more carefully some fast passages, it was like using MusicTrans but with video. 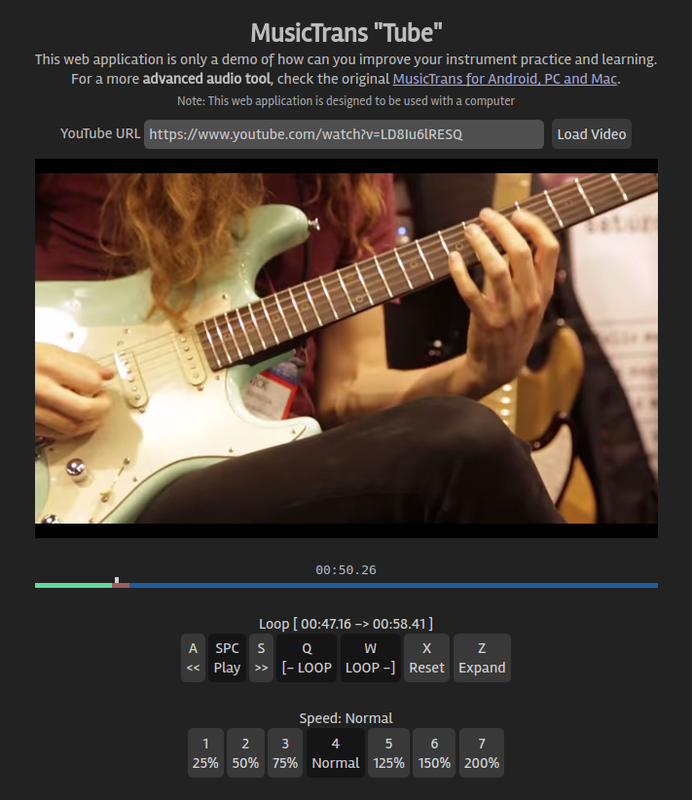 The problem is that the slow down feature of YouTube is not very easy to use when you have a guitar in one hand and you are restricted to use only a mouse. And forget about looping!! It requires lot of precision with the pointer. This is not an audio/video processing tool, because the YouTube player provides this functionality. At the same time, it will stop working if YouTube removes the functions required for this to work. If that happens, I would work on integrating video into MusicTrans. The code is Open Source and it is available in the GitHub Repository for MusicTrans Tube.